When it comes to this Battle of Alberta, Edmonton might just hold all the right cards. And this “battle” is in a forum much more important than one for athletes: it’s about jobs, economic recovery and growth. When compared to Calgary head-to-head, Edmonton has a more diverse economy, a massive downtown rejuvenation, a growing health tech cluster and throngs of young grads streaming from its colleges and universities, attendees heard at the Edmonton Real Estate Forum on May 10. All are reasons for optimism the city is better positioned to rebound from Alberta’s economic downturn than its fierce rival a few hours south. “We have a highly educated work force, low cost of living, proximity to our river valley and a re-emerging downtown that’s brought a lot of life to the city,” said Mike Saunders, vice- president of development for Qualico Commercial. 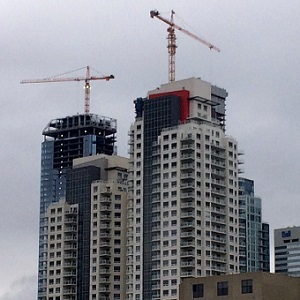 Qualico played a big role in what’s happening downtown by building the 28-storey Epcor Tower. The LEED and BOMA Best gold-certified tower opened in 2011 and has recently acquired another blue chip tenant in BioWare, part of the Entertainment Arts gaming empire. The homegrown BioWare has leased three floors, 75,000 square feet, and should begin moving in late in 2018. “I think there are a lot of things that are working to try to balance out the economic drivers relative to our energy sector,” Saunders said. If that didn’t lead to a buoyant mood during the day at the Shaw Conference Centre, it at least allowed some rays of sun to shine in. “The optimism I’ve seen here today . . . I am much more bullish on this market than I was 12 months ago,” said Chris Nasim, the vice-president of asset management at GWL Realty Advisors, during a discussion of the city’s office market. “I would much rather play in this market than Calgary for the next five years, because Calgary is a grind. Nasim would know. He has experience working in both cities. While Edmonton’s citywide office vacancy rate is at about 19 per cent, Calgary’s remains well over 20 per cent. In the downtowns, the difference is much more pronounced, with Edmonton below 15 per cent and Calgary pushing 28 per cent, depending on whose figures you use (different data companies calculate vacancy rates slightly differently). Edmonton’s downtown is also undergoing a serious disruption, but for a good reason. The ICE District project, led by Katz Group, is a multi-tower, $2.4-billion exercise in city building around the new Rogers Place arena and entertainment complex. It’ll bring almost two million square feet of commercial space on full build-out and is already causing major shifts in downtown tenancies. “Ice District obviously has been a game-changer for downtown Edmonton,” said office panel moderator Chad Boddez, the senior vice-president of office leasing and sales at JLL. “We have new towers, we have new residential . . . a great vibe to the downtown. Calgary does have the oilpatch HQs, if due to some unexpected turn of events oil and gas prices suddenly rebound on a global scale. But there is little hope for that at this point – and Nasim said Calgary has up to 14 million of its 42 million square feet vacant. “Some people would also say two million square feet (vacant) in Edmonton scares me more than 14 million square feet in Calgary, because in Calgary you can get a wild, white swan sort of event,” Nasim said, which could rapidly lead to the absorption of a couple of million square feet. In addition to Edmonton’s downtown construction, events on the periphery are having an impact. Events of that sort are not currently happening in Calgary. First, Edmonton is the provincial capital, with 27 per cent of its workforce in public sector occupations, which also includes education and health. That means opportunities at buildings such as Edmonton’s 1960s-era CN Tower, where Alberta Health Services expanded its lease by 180,000 square feet late in 2017. The space in the 27-storey building had opened up as part of the ICE District, and downtown development, domino effect. On the education front, just one of those institutions, Norquest College, has almost doubled its student population in the past five years and has been building to accommodate them. Those schools are also turning out a large number of grads in the health field, who are in turn moving into the city’s burgeoning health care sector. In particular, along with their fellow tech grads, the health care technology field. “The tech industry is a great new entrant into the market and they could be one that definitely explodes and absorbs a lot more than anyone projects or forecasts,” Nasim said. “That is why I am much more optimistic on Edmonton now, seeing a new nugget of demand that we haven’t seen or predicted. Other tech commitments to Edmonton include Google Deepmind, which has partnered with the University of Alberta and will create a downtown office; as well as hosting one of three Canadian Institute for Advanced Research artificial intelligence centres of excellence. “I see this as being a more permanent disruption in terms of how we view ourselves, how our city is viewed elsewhere, other companies and tenancies coming to this market,” said Kathleen McCabe, vice-president of global real estate for Stantec Engineers, a global firm based in Edmonton. True to those words, Stantec itself will be consolidating its 1,500 local employees from multiple offices into the new Stantec Tower at ICE District. “It is a changing landscape, there has been a big disruption but I think we are a resilient city. We’ve come back from some of these challenges in the past and I think it’s a different level of coming back this time,” McCabe said.